Regular readers will recall that I’ve made the Meat Pie before. However I missed out a key step, and so decided that I couldn’t really call it ‘done’ without actually doing it properly. Today is that day. 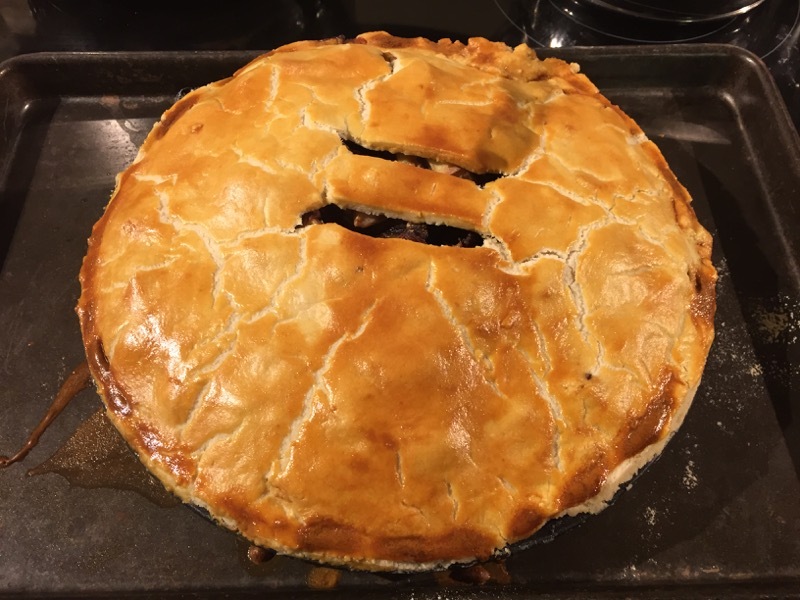 If you gloss over the sheer terror of having to make pastry again, the Meat Pie is really very easy to make. But first, that pastry. I use the KitchenAid to mix the lard and flour together into the usual “breadcrumbs” and then add a little water until it comes together into a ball. I wrap it in cling film and pop it in the fridge while I get the pie filling together. 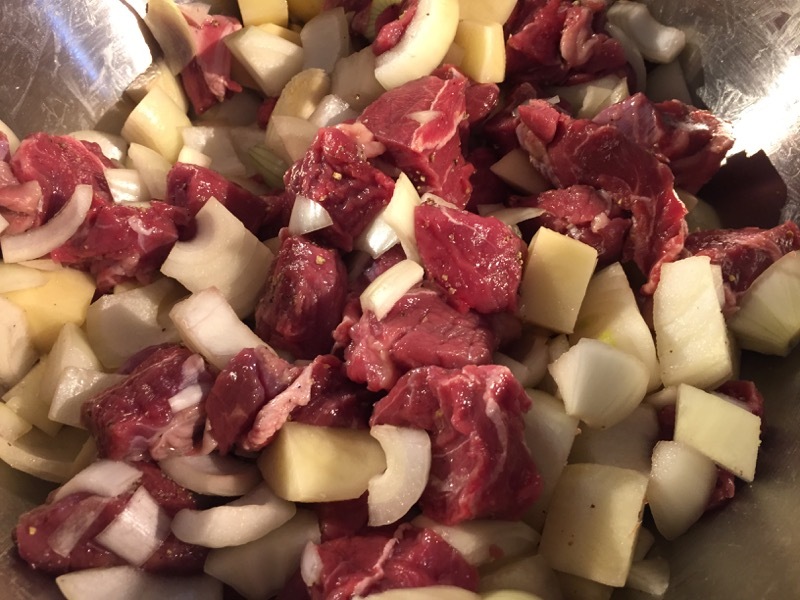 The filling is simply cubes of beef, with diced onions and potato, seasoned with salt and white pepper. I mix it all together in a large bowl, and then get the pastry back out of the fridge. I roll out the pastry and line a pie tin with it. I have to be honest, my pastry skills haven’t really improved since last time I made this. The pastry is a little crumbly – I think I really needed a little more water. Now I need to add the filling. As I start to pour the filling into the pie, I realise I’ve made the same mistake as before. The first thing I missed out last time was a tablespoon of flour – and I very nearly missed it out again! I scrape the filling out of the base, return it to bowl and stir in the flour. Now the pie can be filled. Finally, I roll out the pie top and start to lay it over the pie, and as I do so, I remember the second thing I missed out last time around. Water. I need to add water into the pie. What is it with this recipe? Why do I keep making exactly the same mistakes each time? 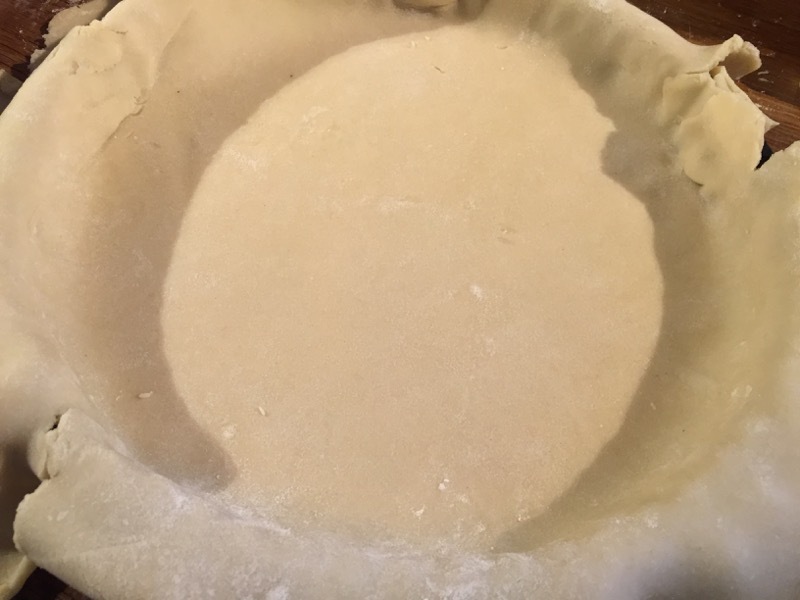 I carefully lift the top back off the pie, add the water and then replace the top and seal the edges. 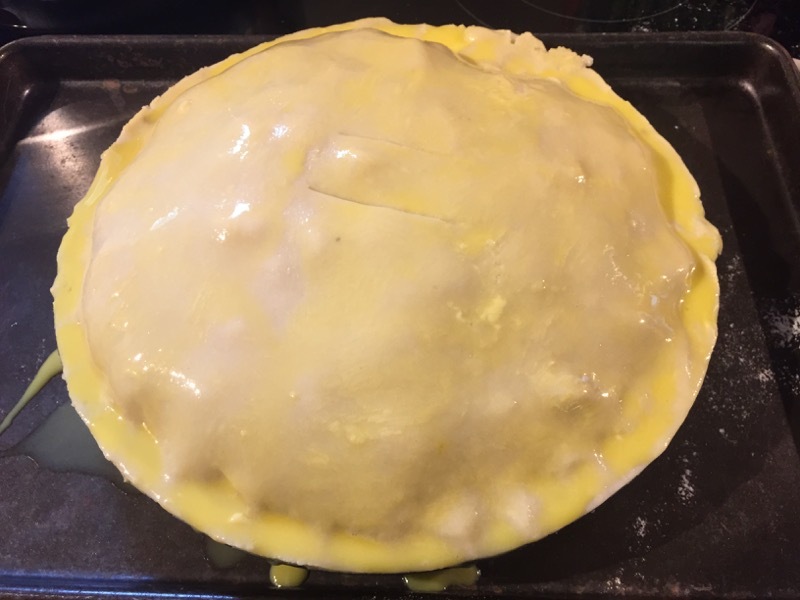 To finish off, I cut two slits in the top of the pie and brush it with an egg wash.
After a couple of hours in the oven, it’s ready. Trying to serve it, it’s clear that the pastry is way too crumbly, so I settle for ladelling dollops of pie crust and filling onto the plate. 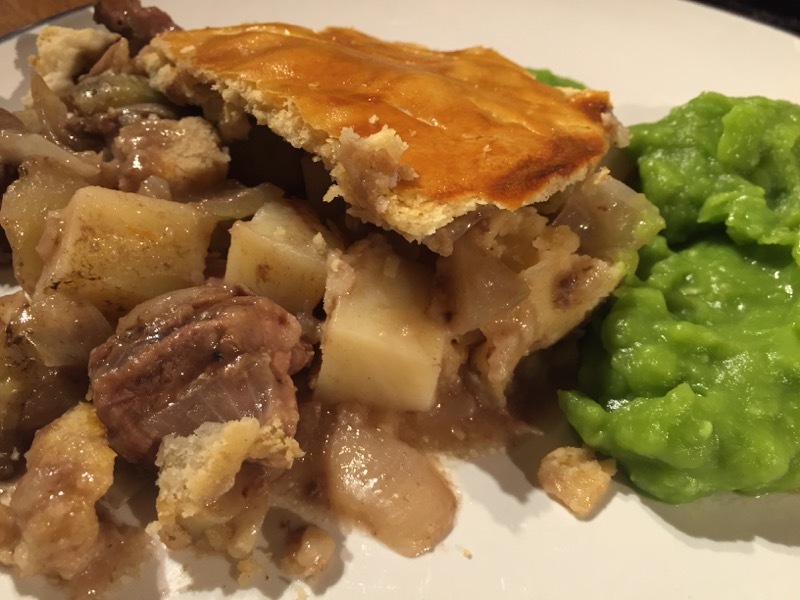 The interior is visibly moister than my previous attempt – I can see gravy in the bottom of the tin. But does it taste better? Frankly, no, it doesn’t. It’s not unpleasant, but it seems more bland than the previous attempt. It seems like the addition of water has diluted the flavours somewhat. I much preferred the other version. At least I can finally tick this one off and mark it as done. When Dave first made the meat pie he forgot one of the instructions, which was to put water into the pie to form the gravy. Never the less the pie was gorgeous. But he felt me must do it again and follow the instructions to the letter. So we had meat pie number 2 on Saturday. Frankly it was quite disappointing. Meat Pie 1 was far superior. Meat Pie 1 was like a large Cornish pasty and tasted lovely. Meat Pie 2 was rather lacking in taste of any kind. The water had just watered it down and the rich taste of meat and onions was missing. Also, as an aside, his meat distribution was poor. I had to send back to the kitchen for more meat because I had almost all potato and onion. I bought some pie to work for lunch today and reheated it in the microwave. I expect soft pastry when I do this (pastry on Saturday was very nice), but the whole thing was a lump of stodge. The gravy had soaked into the bottom pastry so that was just gooey, and the flavour was even less. I ended up adding a good shake of salt to give it some pep. For some reason the meat I had in today’s portion was hard, gristly and tasteless. Bring back the “wrong” pie. It was far better. Even better still, just make Cornish Pasties which are superior in every way when made properly.